JACK - the son of Jim and Barb, grew up in the business. After a few years away as a computer programmer Jack realized how much he missed landscaping. He returned home and does what he loves (and is very good at) - landscaping. PS Jack is a true green & gold PACKERS & Michael Jordan fan. JUDY - grew up vacationing in Minocqua. Her family bought plants from JJ’s Acres since she was a little girl. When she married Jack she said she’d give the business 3 years to determine whether or not she liked it, she’s been here since 1999 and LOVES every day she spends at the Shop! JOHN - a Bears, Cubs and Blackhawk Fan at heart, he grew up in the Chicago area. He started working at JJ’s Acres in 1993 and over the years has developed into our “go to guy” - John is very knowledgeable in perennials, shrubs, trees, plant care, fungus and disease control. RONDA - a Michigan native and a MICHIGAN fan, Ronda came to JJ’s Acres in 2008 after many successful years at a neighboring florist. Her overall knowledge of plants for the garden and home and her centerpiece and wreath designing are a true talent. KIM - grew up in the Lakeland area and truly loves gardening. Kim started at JJ’s Acres in the spring of 2007. 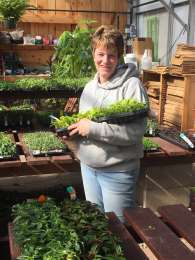 Her expertise is in annuals & annual care has helped keep the Garden Center unbelievably beautiful...she spends most of her spring planting up custom orders - her container gardening style rocks! 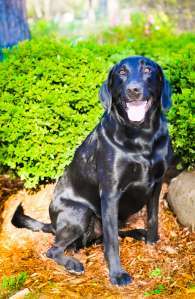 JIFFY is at the Garden Center most days busy greeting customers with her wagging tail, she loves people.